Google X nanoparticles project: A pill to detect cancer and heart disease in your cells. 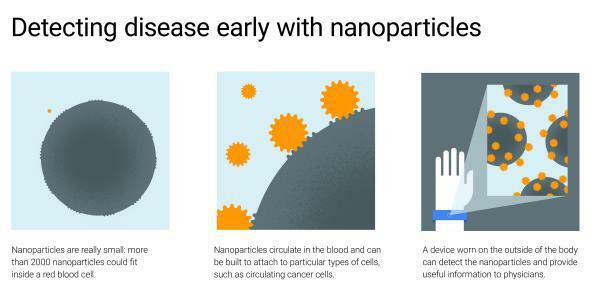 Google’s latest “moonshot:” nanoparticles that can detect diseases in your cells. Google started out by building algorithms that crawled the Web to search for specific types of information. Now it says it’s working on a different kind of search function: a system of nanoparticles that crawl through your bloodstream to search for early signs of cancer, heart attacks, and other specific maladies. The nanoparticles could be delivered by swallowing a pill, and would then “seek out and attach themselves to cells, proteins, or other molecules inside the body,” the Wall Street Journal reports. An electronic device on your wrist would track the particles and interpret their information. The company announced the nanoparticle project at a tech conference sponsored by the Journal on Tuesday. It’s part of a big recent push into health and medicine by the life sciences division of its experimental research lab, Google X. The word “dream” seems appropriate here. Intriguing as the concept is, there’s an awful lot that still has to go right for Google to pull off something like this. It has to develop the particles in a lab, figure out how to make them safe for the body, make the particles distributable throughout the body, enable them to find and stick to the right types of cells within the body, enable them to detect cancer cells, then figure out how to collect that information and interpret it. And that’s all before you get to testing the particles’ safety and efficacy in animals and in Phase I, II, and III human clinical trials—and then getting the FDA to approve it. Did I mention that some people might be a little wary of granting full access to their bodies to a product made by a company whose mission is to “organize the world’s information and make it universally accessible?” And whose business is based on targeted advertising? Google’s Conrad, a noted scientist best known for pioneering a new kind of HIV test, told the BBC that the company would not collect people’s medical information or attempt to commercialize it. Instead it would license the technology to partners who would bring it to doctors and their patients as prescription medical devices, not consumer devices. Google X’s life sciences division has also been working on a smart contact lens for diabetics, tremor-canceling spoons for Parkinson’s patients, and a wide-ranging “Baseline Study” to better understand the genetic and biochemical conditions that make for healthy human bodies. Perhaps this will all turn out to be a misguided money-sink for a fantastically successful Internet company suffering a bad case of hubris. Then again, I can think of much worse ways to spend the billions of dollars that Google has reaped from all our Web browsing over the years. Medical experts may disagree on how realistic Google’s nanoparticle project is, but the research is worth a shot if you’ve got the resources. Who knows: It might just save some lives.